Billys Fresh Seafood & Burgers joined our Mission to help provide access to “Clean Water for All by 2030”. This Mission was initiated by the United Nations. A big thank you to Billys Fresh Seafood & Burgers’s team and customers for joining this extremely important mission on 30 April 2018. "Highly recommended. 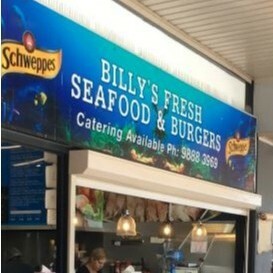 If you're looking for the best seafood in Sydney, you must visit Billy's Fresh Seafood and Burgers. Hands down the best spot to eat out or grab take-away. This is the place my girlfriends and I visit on a weekly basis to catch up for lunch or dinner. Staff are incredibly warm, welcoming and friendly. Absolutely love the food. Fresh, delicious and cooked to perfection. - but most importantly they provide quality food and service. Always an enjoyable experience eating here. The atmosphere is always buzzing. Also a great place to bring the whole entire family!"